Our bodies are precious and now there is a way to protect them on a molecular level. NOW Solutions 100% Pure Evening Primrose Oil contains nutrients to strengthen skin cells and provide nourishment to keep them healthy. 100% Pure Evening Primrose Oil (EPO) is an all-natural vegetable oil. Used as an herbal treatment for a variety of ailments. EPO contains essential fatty acids (EFA's) that support body tissues, including skin. Combined with zinc, EPO may be helpful for a healthier-looking complexion. Each 1 ml of oil contains 80-100 mg of GLA - an essential fatty acid that can nourish and protect healthy skin cells. Pure Evening Primrose Oil (EPO) is derived from Evening Primrose seeds. This oil is pressed at a low temperature to obtain a pure, natural, virgin oil, without the use of solvents, fillers or preservatives. 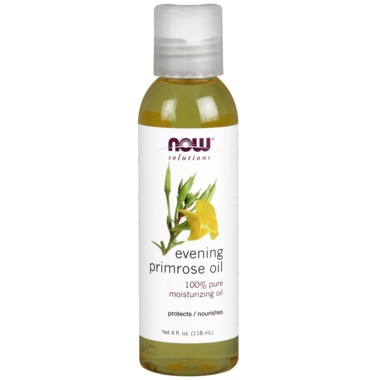 Suggested Use: Massage Pure Evening Primrose Oil gently into the skin to help reduce skin irritation or dryness. 1/8 teaspoon of this oil is approximately equal to one 500 mg softgels. I am using the oil as a supplement, since most gel caps are not vegetarian. The product tastes OK, no rancidity. Wish it was in a dark glass bottle. the manufacturer intends it to be externally used though.